Each fall, Clark-Skamania Flyfishers offers a class titled Introduction to Netbuilding. Taught in Woodland, Washington, students learn to build their own custom laminated-wood nets. Jigs and forms are provided to allow students to build a net to the shape and style of their choice. This is a great opportunity to learn a little-known skill and to make friends. 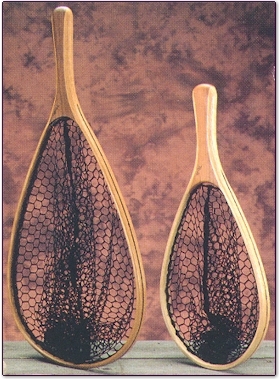 Custom nets make GREAT gifts; so build one for someone special. To find out the date for the start of this year's class, go to the Calendar page. Because of the nature of this class, space is limited and is filled on a first-come, first-served basis. Should you wish to take the course, we will provide you with a list of the materials you will need to bring to the first meeting. For further information, please contact Forrest Koponen at (360) 225-8943.